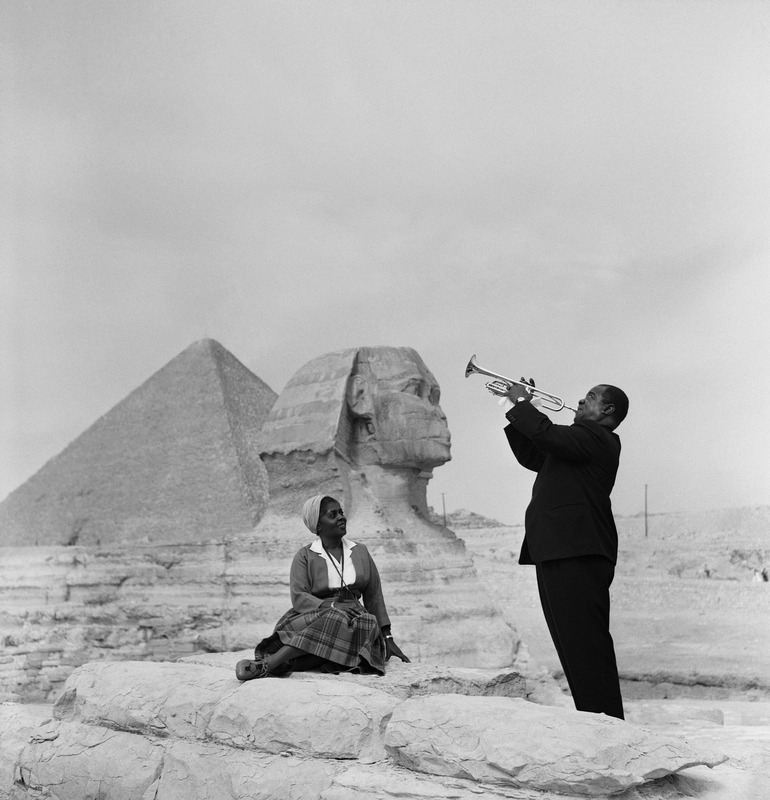 Louis Armstrong playing for his wife Lucille Wilson at the Pyramids of Giza, 1961. If there was one legacy, among many, of president Gamal Abdel Nasser that Egypt could have done without – it is the peculiar suspicion of foreigners, to the point of embarrassment, that rode the region’s pan-Arab nationalism wave in the 1950s and 1960s. A problem that still, in various manifestations, continues up until today through institutions, mass media and the public discourse. Behind the iconic image of legendary jazz musician Louis Armstrong playing his trumpet at the Pyramids – stood an artist that, you would think, had no relation to Egypt’s politics and the Middle East conflict, and infact once stated “I don’t know nothin’ about politics”, was dragged into a mind-boggling controversy. On his visit to Egypt in 1961, Armstrong was standing in a Cairo hotel lobby packed with over 20 news reporters who asked him if he supported Zionism. It must have been like asking Egyptian singer Abdel Halim Hafez visiting Russia as to what he thought of the imperialist forces in the emerging Vietnamese conflict. Armstrong just walked off and left them all in the lobby. It is not known how Nasser reacted. However, he did not stop the musician’s visit to Egypt the following year. “If I don’t practice for a day, I know it. If I don’t practice for two days, the critics know it. 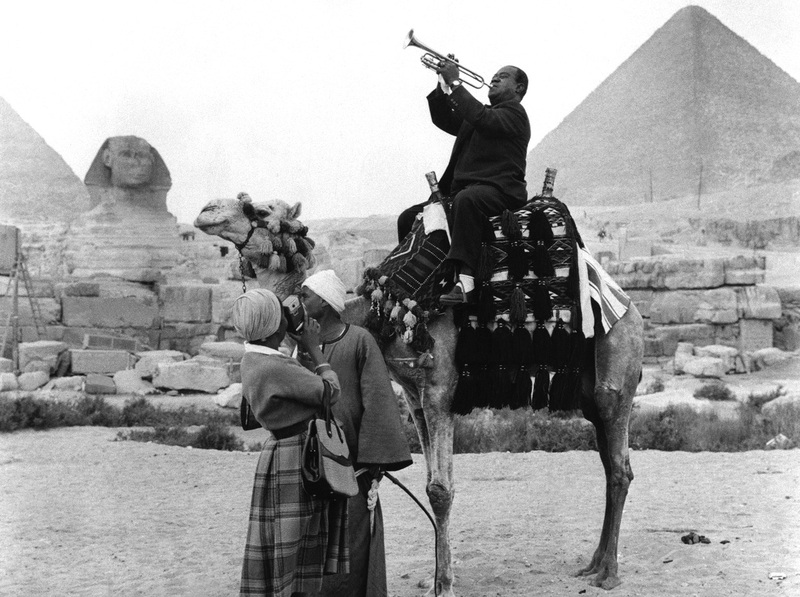 And if I don’t practice for three days, the public knows it” – Louis Armstrong. Poor Armstrong, no wonder why he suffered a heart attack that same year in which his health would only deteriorate from this point onwards. Yet, he was not even spared, at least ideologically, on the international platform. The impoverished thinking that unfairly and irresponsibly attacked Armstrong – raised a generation that rules Egypt today, if not the Arab world, and sets the tone for a destructive conspiratorial language that tarnishes, if not sentences, the innocent, disembowels the political public sphere and foments political and social tensions. Armstrong visited an Israel that has since become an increasingly racist, brutal and a militarised state that would make Apartheid South Africa look like a lightweight. Not helped by the same government that sponsored Armstrong’s visit. Armstrong’s encounter with the Middle East was a microcosmic reflection of the wider cancerous socio-political tumour of denial and scapegoating in the region that just keeps on festering with time. More so, the “What is that Daddy?” responses of Armstrong were refreshingly simple, altruistic and empathetic, in a complex, murky and relentless region where the indiscriminate use of words and charges are prone to lose all meaning. So a posthumous note to Armstrong, nothing has changed since you left the Middle East, just more of the same, and worse. Someday, the meaning of ‘What a wonderful world’ will be understood and sung. Someday.